Riya not ready for Baby! Mere Angne Mein 7th August 2016 Written Updates :- The show starts with Preeti lying to Shanti to meet Lucky as she told her Preeti saying that she spoke to her friend, who had a child recently. Shanti allows her to go. Riya also asks permission. Shanti asked Kaushalya to see how other’s are getting their child as they also want the child in their house. Meanwhile, Shivam recalls Riya’s word and get upset. On the other side, Nandu was waiting for Preeti in the market as a Lucky. Preeti came there to meet him and narrated him everything. She told him that his parents think that she is pregnant and this has happened same when Mohit was in my life. Nandu gets shocked, but he thinks that he will eat the food cook by the Preeti. Meanwhile, Sarla asked Rani to get food for Ashok and talks well. He says you are worried for me these days. But Sarla gets angry and asked how long will I adjust, and will Ashok enjoy with Nirmala? Nirmala apologizes to Ashok and said ticket fell from my hand. Sarla asks her to leave hand and beats her. Ashok shouted asking both of them to stop it. Ashok scolds Sarla and asked you can’t stop me as you made me marry Nirmala and you don’t need to interfere in my life. He asked Nirmala to make tea for her. Meanwhile, Sarla gets annoyed. Riya meets the doctor and asked will there be any problem? Doctor replies her to be positive. Then, Riya saw Shivam outside the hospital and asked why did you come here, will you argue and fight now, I m not scared? He told Riya that these mood swings happens in the days of pregnancy. They both argues as Riya told Shivam that she is not ready for the baby. Shivam leaves from there. Sarla asked Rani why did she get tea when she did not ask? Pari replied that Rani came to hear us and argues but, Rani throws water on Pari. Rai and Rani argue with each other. 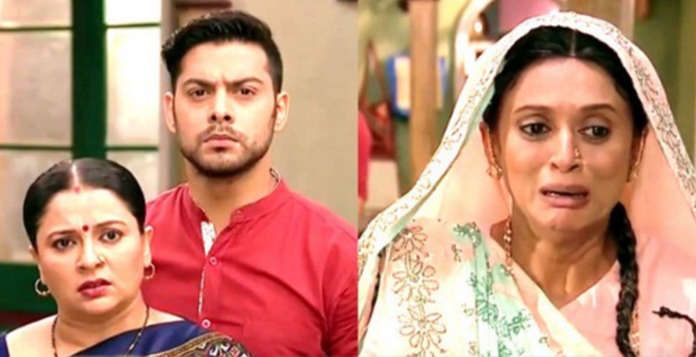 Shivam and Riya are on the way and Ashok called him but Shivam gets angry on his boss. Riya asked him not to get angry. A guy comes and teases Riya. Shivam beats that guy. Riya asked him leave it, deal things maturely. He asks shall I not beat the guy who teased my wife? shall I tell him to tease you? Riya says you would have killed that guy and your anger will be the problem for our future and till that time, we will not think of a baby. They both argue and leaves from there. A saint comes and asked for food and Nimmi gives him food. He also asked Kaushalya to give an old shawl, Shanti asked him will you take everything from our house? He says ego burns everything and gets anger and curse Kaushalya that your family will not move forward. She sends him and worries. Rani goes to Nirmala and asked her how did Sarla come to know that I went to meet Amit? Nirmala told her maybe Amit would have told her and I booked the room by spending money, why will I spoil your plan? Kaushalya worries and asked if that saint’s curse gets true then. Shanti replied don’t worry but I m worried thinking Riya is not giving good news, we will apologize to Lord. Preeti asked Lucky did he not like food? He says it’s good and She asked you have food and I will go home now. She goes. She thinks that he is cheating Nandu by meeting Lucky and gets sad. Shanti was buying vegs and a lady informs Shanti about her bahu’s pregnancy, she did some puja and prayed to get a grandchild. Shanti asked about puja.Shanti says I will give the first laddoo to you, send pandit soon. Shanti smiles. In the upcoming episode, Pandit tells Kaushalya of some Aradhna and says then you will get grandchild’s news. Riya thinks I m not ready for baby.